August 18, 2016. Treaty Recognition Day will take place Friday with the raising of the Treaty 6 flag in Churchill Square in Edmonton. The flag, which permanently hangs in the City Room of City Hall to officially acknowledge that Edmonton lies within Treaty 6 territory, will fly for one week outside City Hall. A commemorative event and celebration at City Hall will follow the raising of the flag, with Mayor Don Iveson hosting Treaty Six Grand Chief Randy Ermineskin and the Chiefs of all 18 Treaty 6 First Nations. The City of Edmonton created Treaty 6 Recognition Day in 2013 to commemorate the signing of Treaty No.6 between the Plains and Wood Cree people and the Crown at Fort Carlton on August 23, 1876. Edmonton was founded in Treaty No. 6 territory. Treaty No. 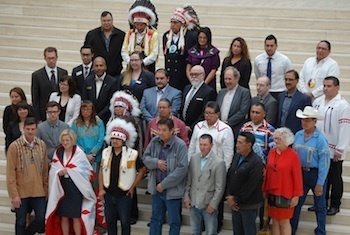 6 Recognition Day recognizes Edmonton’s connection with the First Peoples of this land.